The set up is a forced, damped oscillator governed by a differental equation of the form y'' + (γ/m)y' +ω_0²y = F_0 cos(ω_e t), where m, γ and ω_0 are the mass, damping constant and natural frequency of the oscillator, and F_0 and ω_e are the driving force amplitude and frequency. All 5 of these parameters can be altered with the sliders. The solution to the differential equation is shown, governed by the boundary conditions of the displacement and velocity at t=0, which can be altered by sliding the points Y0 and V0 up and down the y-axis. You can display the temporal behaviour of the displacement (blue), force (green), velocity (red) and acceleration (brown) by selecting the relevant checkbox. You can also show the "response curve" of the oscillator (the steady-state amplitude as a functionof the driving frequency) and the phase difference between the steady state displacement and the driving force. Things to play with: 1. Set the force amplitude (F_0) to be zero to see the "transient" behaviour of the system. This will be underdamped or overdamped depending on the size of γ compared with 2mω_0. 2. 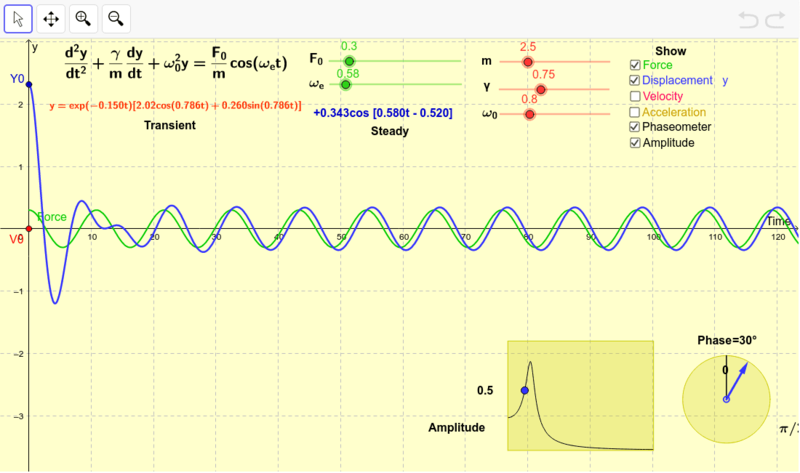 For light damping (γ<2mω_0), notice the behaviour of the system as you vary ω_e, Notice the phenomenon of resonance when ω_e is close to ω_0 (NB: can you see the maximum steady state amplitude is not quite at ω_e=ω_0). What is the phase difference between the displacement and driving force at resonance? What about when the driving frequency is large? 3. The "play button" in the bottom-left of the plot will cycle through the possible values of the driving frequency. Notice how the steady state amplitudes rise and fall and how the phase difference cycles from zero to π. 4. Is the steady state behaviour dependent on whether the transient behaviour is underdamped or overdamped? Is it dependent on the initial boundary conditions? 5. If the damping is made large compared with 2mω_0, what happens to the transient behaviour and the resonance phenomenon?